SCAR welcomes the support of donors to further its mission and objectives. 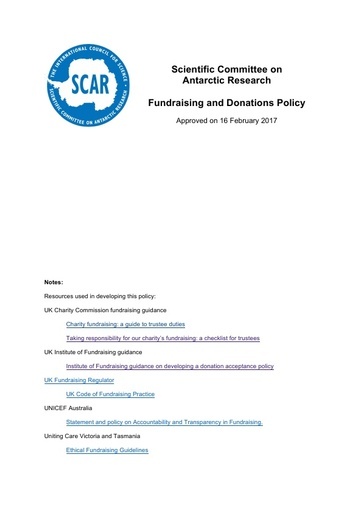 The purpose of this policy is to provide a guide to those authorised to fundraise and accept donations on behalf of SCAR which allows clear and consistent decisions regarding the acceptance or refusal of donations. the balance of costs incurred in fundraising activities compared to resources gained. This policy will be publically available from the SCAR website and the Executive Committee will ensure that fundraising aims and achievements are communicated in an open and transparent manner. This policy also serves as a guide to the SCAR Development Council in their fundraising activities.